The TEUFELBERGER roope! and roope! XPS are made from braided color coated Dyneema® terminated by a splice and a sewing. Its material and construction make the roope! anchor sling and the roope! XPS express sling your perfect partners for abrasive environments. In the roope!, (pronounced rue-pee!) TEUFELBERGER achieves a crucial advantage in “safety“, the most important of all aspects! The base rope of the roope! anchor sling and the roope! XPS made of braided Dyneema®. Therefore is easier to handle than conventional cords, which cannot always be arranged correctly and are susceptible to great wear. The roope! 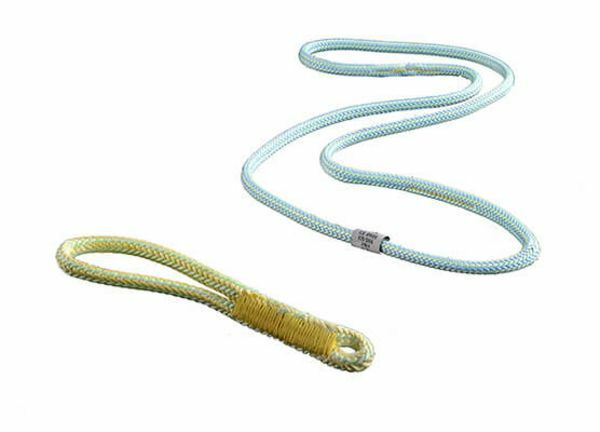 sling performs up to five times better than normal rope when subjected to abrasion over multiple cycles. In addition, it displays exceptional high strength when exposed to falls over a defined edge! Furthermore, the roope! features a consistent and intense coloring coating on the Dyneema®, resulting in a highly visible and appealing design. The roope! xps express sling is available with a stitched eye for better handling in carabiners. Roope! slings have been used for years in life safety applications throughout Europe and are now making their way to the rest of the globe.